Slovenia is full of natural wonders and sights, where you’ll be blown away by its beauties. There are many well know tourist areas you can visit in Slovenia as a day trip from Ljubljana (the capital), which get lots of tourist on a daily basis. But if you enjoy hidden gems more, you should consider visiting the Pekel Gorge. 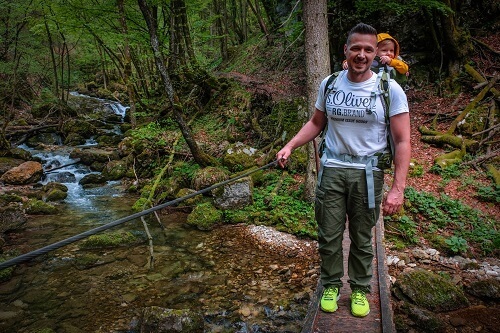 We are lucky enough to have Pekel Gorge (in Slovenian language Pekel means Hell) pretty close to our home and being able to visit it when we are in the mood for some hiking. We like to visit the place mostly during hot summer days, but you can actually visit it year-round. 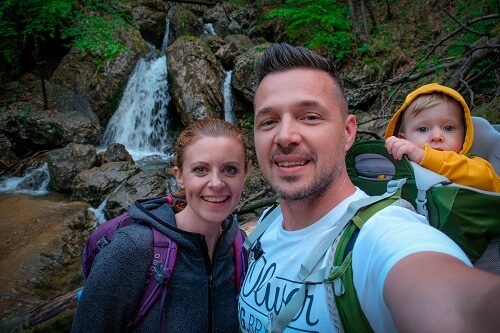 If you are staying in Ljubljana, Pekel Gorge would be one of our best picks for a day trip from Slovenian capital, so do check it out if you like outdoor and nature. Pekel Gorge is perfect destination to escape the summer heat and cool down even though you are hiking. Ljubljana has been geting many tourists in the summer and can also be very hot, so a day trip to a cooler and quiter place is a nice change for many. 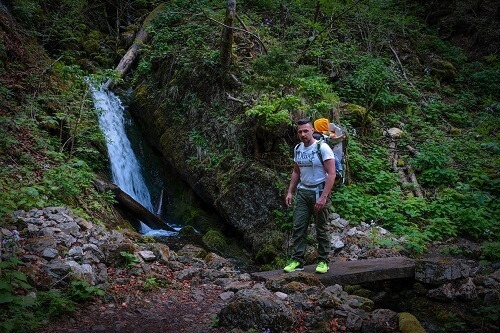 Most people visit Pekel Gorge for hiking to its 5 waterfalls. If you are fit enough, not afraid of heights and some challenging climbs (including rungs, steep leathers), you will have no problems with reaching all 5 waterfalls. But if you are not feeling comfortable to do these climbs or maybe traveling with young kids, there’s still nice path up to the second waterfall (16 meters high). The best season for seeing the most beautiful waterfalls is spring and autumn – after the rain. Pekel Gorge is still nice during the summer, but it might lack of water. 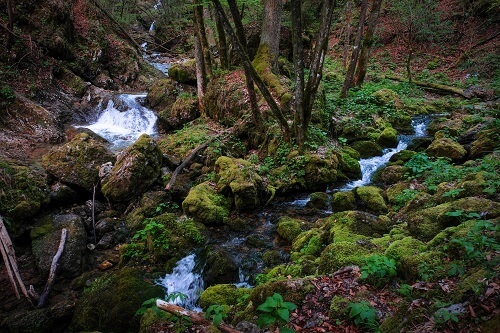 Instead of seing all five waterfalls, you’ll just do a good exercise, surrounded by unspoiled nature. Well, but that’s not bad either, right? Visiting the Pekel Gorge might be more popular during summer than winter, but you can still do a day trip from Ljubljana during colder months. Be aware that when temperatures are low enough to be freezing, the necessary equipment for the hike are crampons. 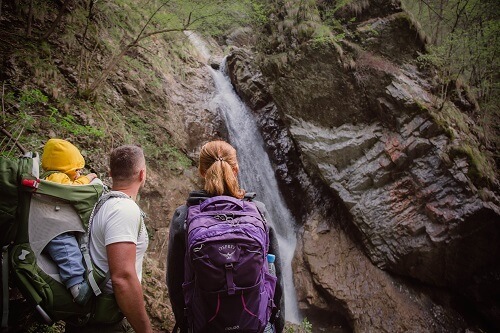 The hike to the last three waterfalls can surprise you with some falling rocks, so visiting Pekel Gorge in winter or summer, we’d also recommend you to have a helmet with you. Before the hiking path starts, there’s a fairly big parking lot available where you can leave your car / bike. Just few steps away is also a local restaurant (best known for trouts), but have in mind it is opened from noon on and also closed on Mondays and Tuesdays. 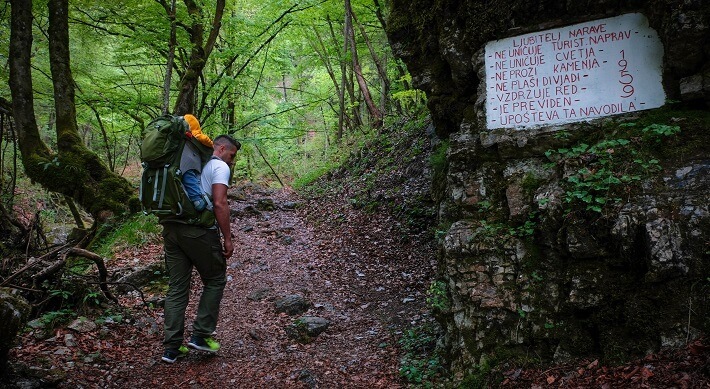 If you’ll be visiting Pekel Gorge as a day trip from Ljubljana for hiking, you need around 1 hour and 15 minutes to reach the last fifth waterfall from the parking lot. And while you are already there, you can also join the trip by visiting the Technical Museum of Slovenia or maybe enjoy some free time at Rakitna or Podpeč Lake. P.S. Ljubljana, the capital of Slovenia, is just 23 kilometers away and not so far from Borovnica town, which can be reached by train. 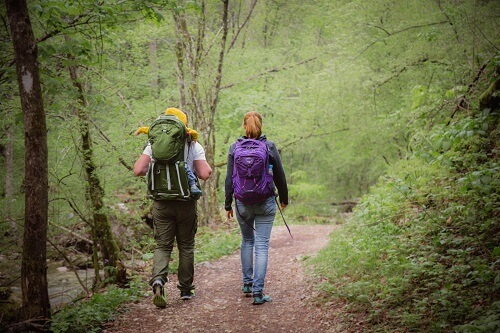 But if you don’t feel like walking 4 kilometers from Borovnica to Pekel Gorge, rent a car in Ljubljana for a day trip and join some other activities to fullfil your day. *All the photos were shot during a campaing of Slovenian water brand, which we filmed there.